All Star Directories, Inc. is the Internet’s fastest growing publisher of online and career school directories, matching millions of highly qualified prospective students with the schools that best meet their education needs. From leading research institutions to fast-growing online and for-profit schools, more than 5,500 featured schools trust All Star Directories as the authority in online student recruitment. The All Star Directories network of sites focus on a wide range of fields including health care, art, business, teacher education, psychology, criminal justice, computer training and nursing. 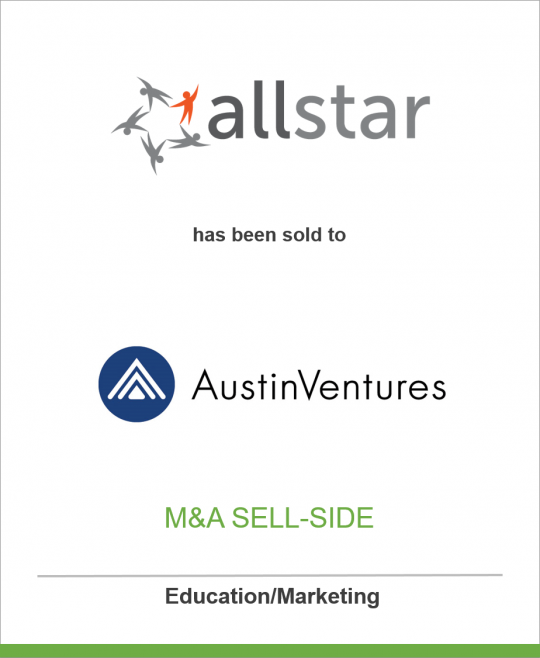 Austin Ventures has been working with talented entrepreneurs to build valuable companies since 1979. With $3 billion under management, AV is the most active venture capital firm in Texas, and one of the most established in the nation. With a focus on business services, information services, computer and communications hardware, and enterprise software, Austin Ventures invests at all stages of company development, from $100,000 “planned experiments” to $50+ million investments in management buyouts. Visit austinventures.com for more information.